AUGUSTA, Ga. — After finishing at No. 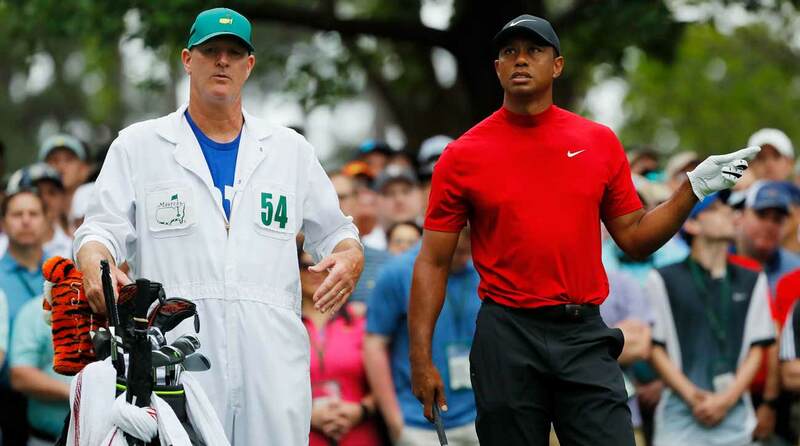 5 on Sunday at the Masters, Tiger Woods’ caddie Joe LaCava had a word with him. Woods had just three-putted for bogey, his second in a row, while Francesco Molinari, the leader in his sights, pulled off some up-and-down wizardry from short of the green. His lead — Woods’ deficit — was stretched to three. LaCava pulled his boss aside. It was time to remind Tiger Woods who he was. After the round, Woods cited that conversation as a turning point — and grinned when he was asked about specifics. The pep talk worked. Woods stuffed his tee shot on the par-3 6th. His birdie try slid by, but no matter: his approach shot at No. 7 was even closer, leading to a kick-in birdie. At 8, Molinari poured in a birdie putt right in front of him, but Woods answered with a steely putt of his own. Game on. Tiger Woods' caddie Joe LaCava gave him a few key words of advice after bogeys at 4 and 5. So what were the words Woods needed to hear? LaCava, perched happily on the tailgate of his courtesy car in a New York Giants Saquon Barkley t-shirt, gave reporters some insight. It was clear from Woods’ takeaway that LaCava’s words left a strong impression. On Sunday at Augusta, there’s no question that caddies are crucially important, particularly down the back nine in a swirling wind. LaCava walked through some of their decisions: Staying certain that 9-iron was the correct club at 12, despite Molinari dumping 8-iron in the water short. Picking 5-iron from 227 after a long wait before his approach into 15. And knowing that full 8-iron — not some cut 7 — was the shot to hit on 16 to slam the door on the tournament shut. All three ended up pin high. LaCava was quick to downplay his own role in the victory — and in Woods’ comeback, big-picture. “I didn’t put in all the hard work. I didn’t have all the surgeries. I wasn’t down in Florida grinding. So for me, it’s easy. I just show up, try to do a halfway decent job and he has to do all the tough work,” he said. But above all, it’s LaCava’s loyalty that has stood out. Consider this quote from late 2018, when LaCava looked back at the dark times, the injury times, when there was no certain golf future. “Don’t worry about the flag. Who’s going to walk out of here with that flag? !” McNamara asked, laughing. LaCava found the keys. He locked the car. And he took one last peek in at the flagstick from the winning hole, as if to make sure it was all real. This is a details guy, after all. A details guy with a winning touch.